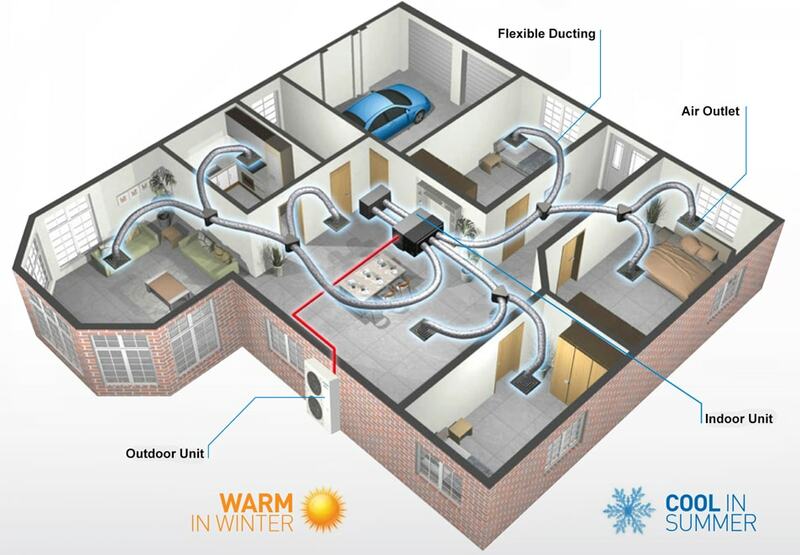 Constant air volume systems accomplish cooling and heating by varying the supply air temperature and keeping the air volume constant. VAV systems keep the air temperature constant and vary the air supply volume. VAV systems are easy to control, are energy efficient, and allow fairly good room control. A drawback is possible poor ventilation under low load conditions, and humidity control is difficult under widely varying latent loads. 1. Significant space almost 10 to 15% depending on the economy of scale may be needed for AHU room/duct risers. 2. Requires additional duct clearances, which may add to building height and vertical airshafts can reduce the usable floor space. 3. Air balancing is difficult to achieve particularly in large systems and requires great care. 4. The logic control of achieving optimum conditions requires expert design planning and experience. There are various options among all-air systems and to ensure right selection requires a foresight of control logics and sequence. 5. May encounter hot or cold spots particularly in the perimeter zones having large glazing. 6. Installation and accessibility of equipment demands close cooperation between architectural, mechanical and structural engineers. 7. Airflow balancing is difficult. The reheat control option with all-air system is very energy inefficient as it requires first overcooling and than reheating for effective humidity control. 8. Noise in fan operation may be a problem in certain types of Spaces. 9. Close coordination is needed between designers and installers to assure accessibility to terminal units.